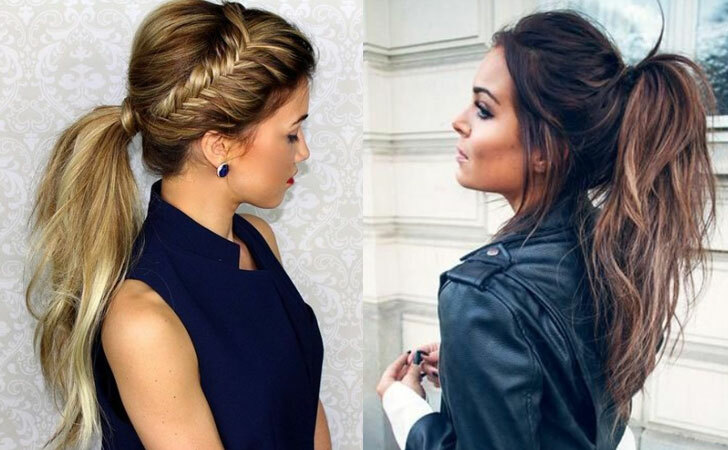 Opting for a ponytail is the easiest way to sweep your hair off your face for an easy and practical style. However, a ponytail doesn’t need to be boring and simple – you can create a range of absolutely beautiful looks which are perfect for the day time or the night time too, all by adding a unique twist to your ponytail. We’ve gathered a selection of stunning ponytails in this gallery to inspire you to wear your hair up with pride! This beautiful lady has been incredibly clever with her ponytail, sweeping the fringe section of the hair into a french braid style which tucks into her ponytail. 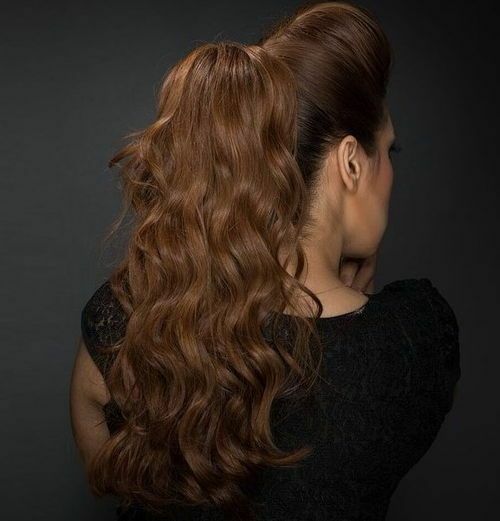 Her luscious brown curls fall from the ponytail down over one shoulder in a truly striking style. As you can see from her beautiful dress in the picture, she’s opted for this style for a special occasion, and it looks absolutely glorious! This stunning dark brown ponytail is crafted from glossy, straight brown hair which is finished with a fringe – chosen to frame this lady’s gorgeous face. She’s swept her beautiful brown hair up into a ponytail and has back combed the top section to create a gorgeous quiff style which finishes in a ponytail. 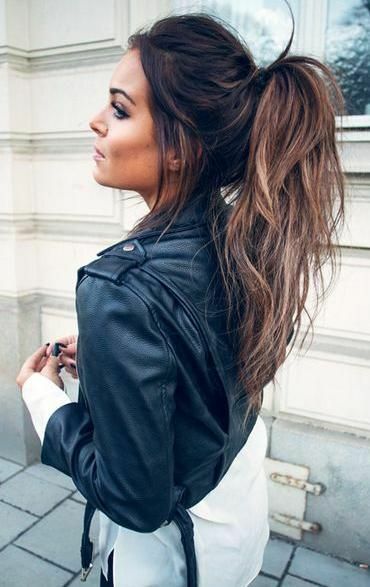 She’s roughly tousled her ponytail to add more volume and we adore this look. This beautiful girl has opted for a high ponytail that looks simply stunning, as we’re sure you’ll agree – not least because of the stunning tousled texture of her hair! She’s added loose curls throughout the length of her hair, which is parted in the centre, and she’s swept it up for a high ponytail and let her gorgeous tousled hair cascade down her back. We can’t quite decide if this is a stunning hair style or simply a work of art. 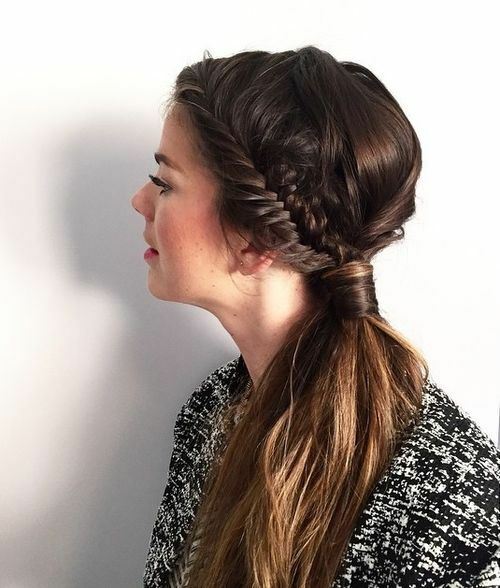 This gorgeous style has a chunky french braided look throughout the top layer of the hair, which scrapes the hair back into a beautiful brown braid to the back of the head. She’s finished the braid with a high ponytail, and has tightly curled the rest of her hair for a beautiful finish. 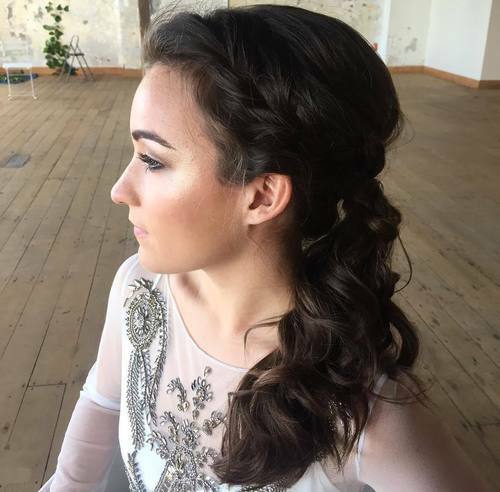 Fishtail braids are incredibly popular – and when we look at this stunning lady’s hair it’s really not difficult to see why! She’s swept the top of her hair into a tight fishtail braid which works from one side of the head to the other, and finished the look off with a ponytail at the back of the head which allows her long hair to fall down her back looking beautiful. This wonderful lady has styled her beautiful blonde curly hair into a low side ponytail in a gorgeous twisty look that we can’t get enough of! She’s twisted both sections of her hair tightly so that they gather and meet in the middle. 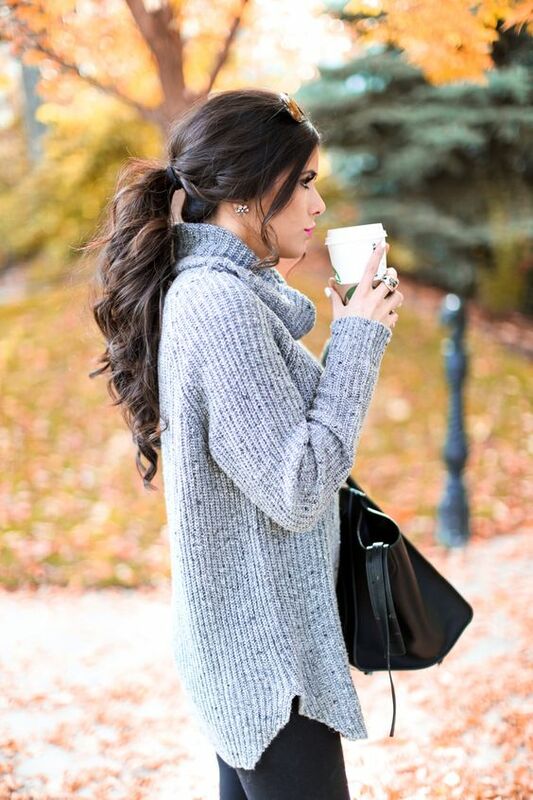 She’s then wrapped hair around the low ponytail which falls across one shoulder in an effortless fashion we adore. If you’ve got a striking hair colour like this gorgeous lady, then opting for a simple and classic high ponytail can show off your gorgeous locks like no other! 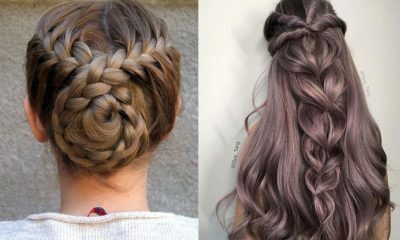 This effortlessly fashionable female has gone for grey hair which is all the rage recently – and one look at this beautiful ponytail style will show you why! We love how her tousled hair falls down her back with this high ponytail. This look is absolutely beautiful – incredibly simple but totally effective at the same time; don’t you agree? 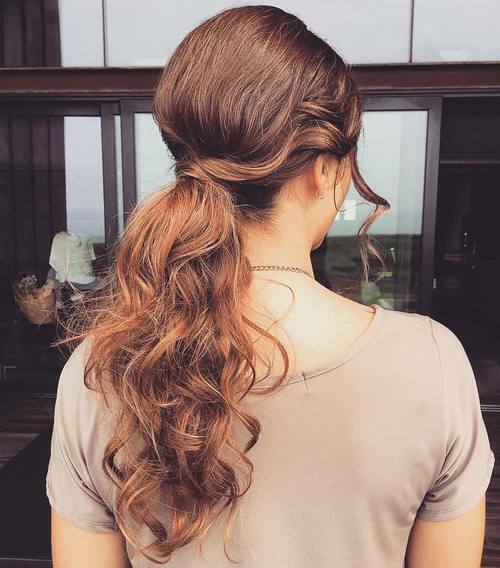 Her gorgeous hair is a beautiful blonde to brown balayage with a sweeping side fringe, and she’s gathered the hair to one side and wrapped a section around the ponytail so that it covers the hair tie, and her hair falls in ringlets over one shoulder. 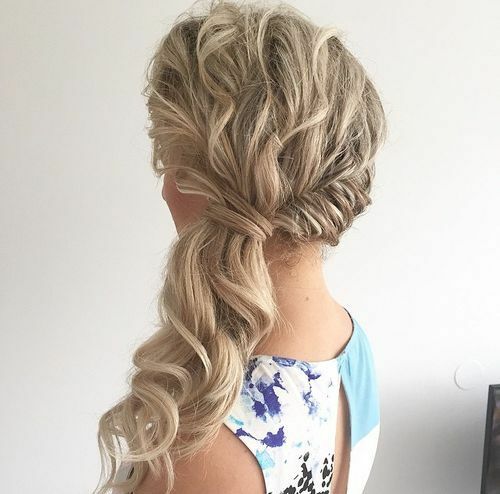 This beautiful ponytail is a stunning hair style on its own, especially because of this woman’s striking white blonde curly hair – the ponytail has given her bouncy curls life as they cascade down her back. 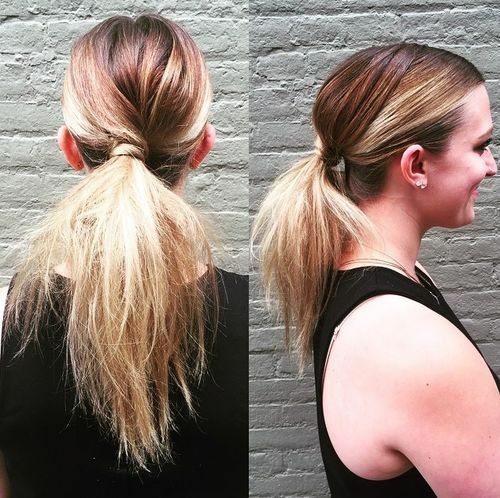 This clever lady has, however, taken her ponytail to the next level, by implementing a braid on one side from the root to the tip – it looks stunning! 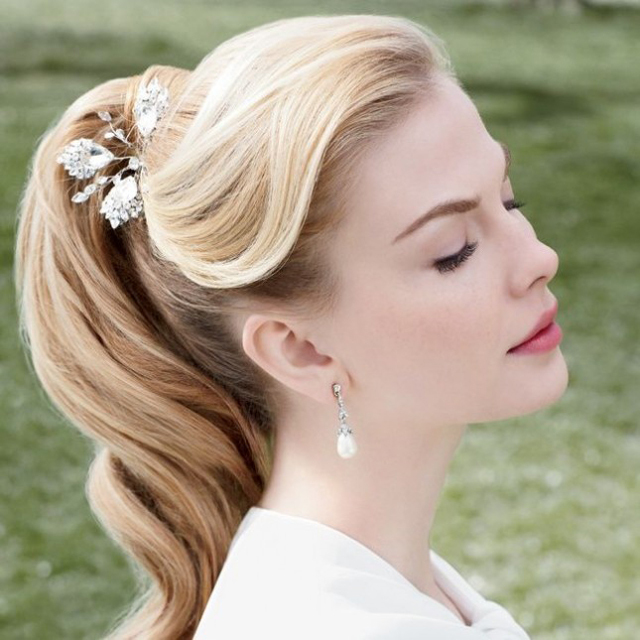 This absolutely gorgeous hair style is so striking it is just perfect for a formal event or a smart occasion! This wonderful lady has used her copper and blonde hair to her advantage by creating a completely unique and voluminous braid that folds in at the centre of the back of the head to create a wonderful and flamboyant finish. This simply striking look perfectly finishes off this beautiful lady’s long, sleek and blonde hair to perfection, creating a style which is simply perfect for heading out. She’s back-combed her wonderful hair to add lots of volume to this beautiful look, and then gathered the hair into a low ponytail at the back of the head. She’s let the hair which falls around her face frame the look perfectly. This gorgeous ponytail look is the perfect combination of smooth and sleek and curly, bringing the two together in a striking finish that we just can’t get enough of. She’s pulled the hair back and fashioned it into a gorgeous quiff to add to body, then secured it with a high ponytail. Wrapping the hair around the band, her lovely curls then fall down her back effortlessly. 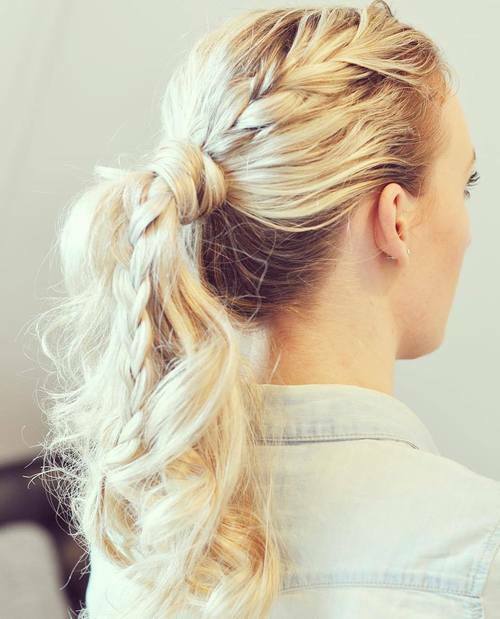 This is a show-stopping ponytail style which is absolutely guaranteed to attract attention for all the right reasons! This lady’s breathtaking copper hair is not only a beautiful colour, but a fabulous style too. The front is twisted into a large quiff section full of volume, then fastened to a ponytail section which falls in big, bold curls down her back. This gorgeous and rich brown hair is highlighted with a gorgeous blonde tone to add lift to a stunning colour, and we can’t get enough of this look. To accentuate the lovely colours at work, this lady has fashioned a quiff from the top section of her hair and then tied it into a high ponytail, having curled the rest of her hair for a truly striking finish. 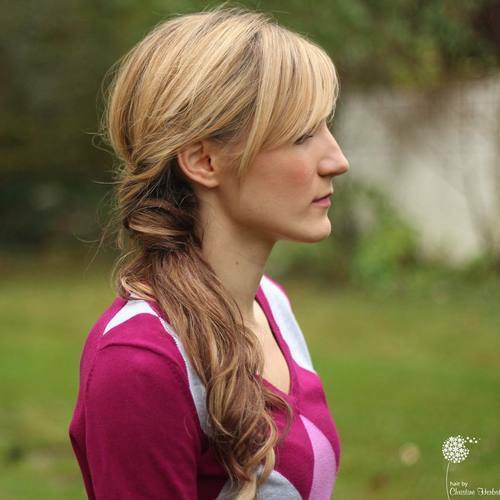 There are so many ways to add life to a ponytail style, as this wonderful lady has proved. 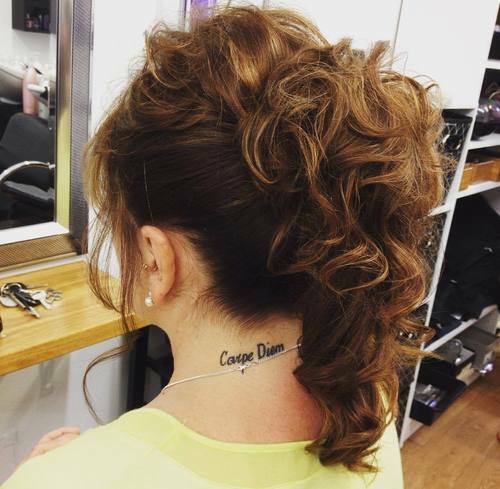 Her tattoo says ‘Carpe Diem’ which means seize the day, and with this incredible hair she most certainly is doing that! 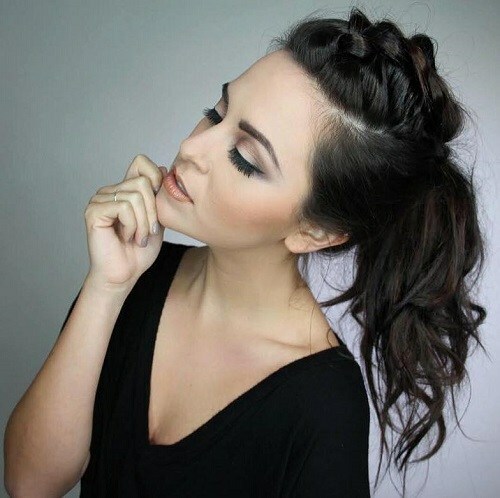 She’s secured the bottom section of hair in a ponytail and tightly curled the top layer, pinning it so that it creates a beautiful curled effect for the top layer of the hair. This stunning hairstyle is absolutely beautiful – the perfect way to jazz up your typical ponytail and add an element of interest. This beautiful blonde hair has some lovely tones running through it, and has swept her locks back in a sleek ponytail with lots of volume. She’s secured the hair, wrapped a section around the bobble and loosely curled the ponytail for a wonderful finish. 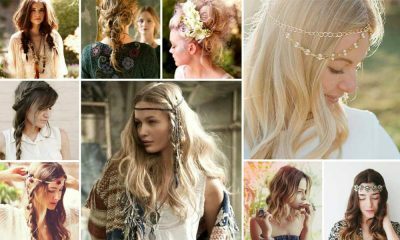 This intricate and gorgeously crafted hairstyle is simply stunning – just perfect for the festival season! This lady has gone for two chunky braids on either side of the head from root to tip, and has gathered them together with the rest of her hair in a ponytail at the centre of the back of her hair. 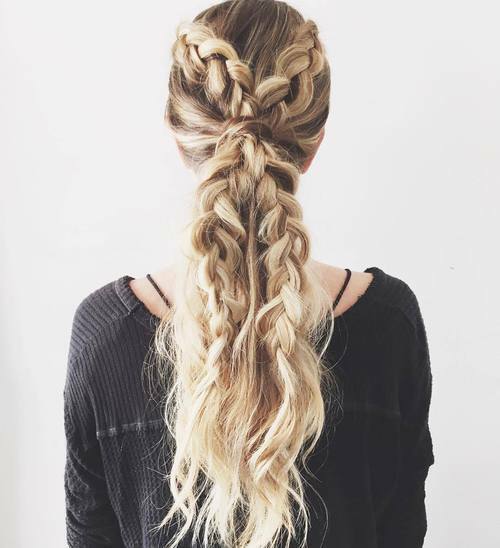 The braids fall among her curly hair for a beautiful finish. If you fancy wearing your hair up for a wedding then we think this lady’s impeccable style is the most perfect look to do so! This lady has beautiful rich brown hair which is finished with a copper balayage effect. 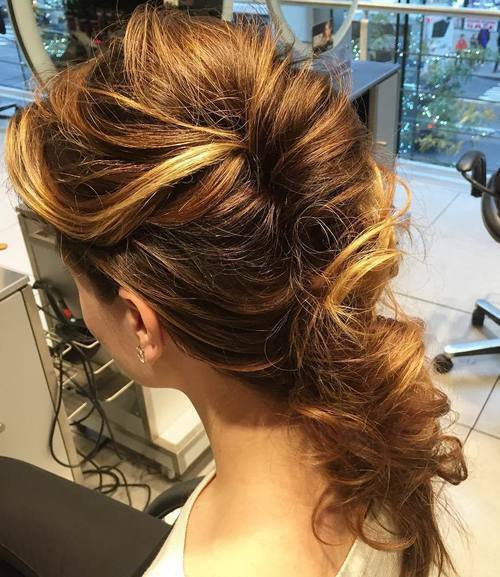 To highlight this remarkable colour transition, she’s opted for a stunning low ponytail full of curls and bounce – we think it looks simply striking. If you want your ponytail to be unique, striking and oh so cool – then why not take inspiration from this beautiful lady? 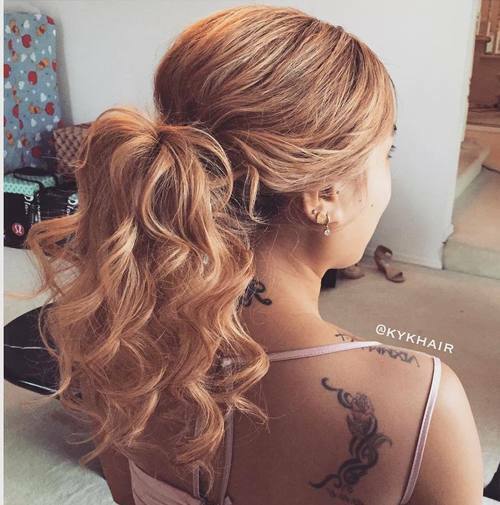 She’s taken her gorgeous highlighted hair which is straight and sleek, and created a unique twisted look to fasten her ponytail with. She’s then roughly tousled the ponytail to create volume and an individual style that we love. This remarkable hair style has a corset-style braid working from one side to the other of the middle of the head, uniting two beautiful braids for this contemporary style. 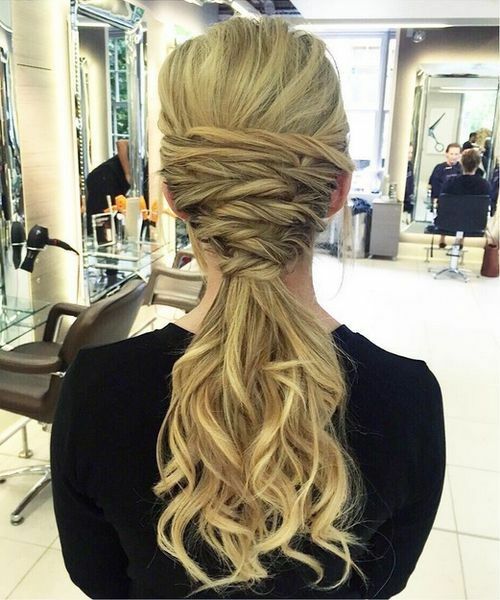 This fabulously fashionable woman has twisted her braids to create a wonderful and unique look, fastening them with a low ponytail that is finished with glorious ringlets. This wonderful copper hair has been fastened into the most stunning up do, which is simply perfect for a prom or a formal event where you’re required to look the part from the hair down! this lady has curled her beautiful hair from the middle down. She’s swept the top part of the hair into a wonderful back combed quiff style, then fastened it into a ponytail so the curled ends fall perfectly. One of our favourite ways to make a ponytail more stylish is by wrapping a section of hair around the hair tie or clips that hold the ponytail in place, disguising the fastening and creating a sleek finish. 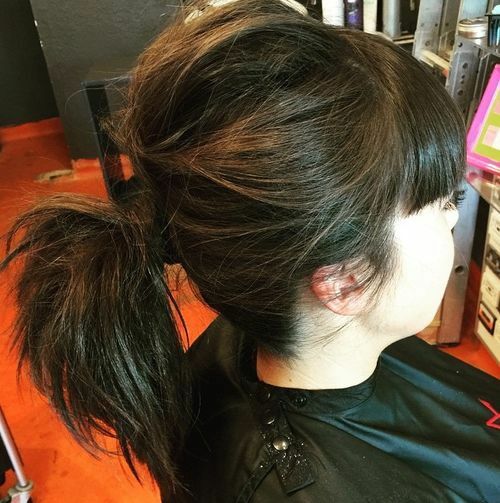 This lady has incorporated this into her beautiful ponytail – and it looks amazing. She’s pulled the front section of hair into a fashionable fishtail braid along the one side which really takes the ponytail to the next level. 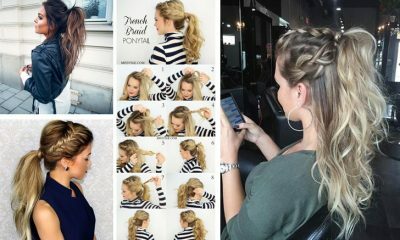 We hope this fabulous blog post has inspired you to be a little more adventurous with your ponytail the next time you fancy trying something different with your hair – but remember, Styles Weekly is simply full to the brim of hair inspiration so if this wasn’t quite what you were looking for, we have hundreds more blog posts that are guaranteed to meet your needs.